A February 1924 cover photograph of The New Near East magazine asks “Will you send a Valentine to a Near East child — A year of life for $60, or a month for $5?” Is anyone able to provide some precise information on this wonderful photograph? Last year on Valentine’s Day we had posted for us by Asbed Bedrossian a photograph from the back cover of a copy of The New Near East - volume 6 no. 5 February 1921. Although it is nowhere stated in that issue, the charming photograph was that of a little Armenian girl born with the name Arpenia Karagosian. Relief worker Mary Hubbard, who knew Armenian, had chanced upon the baby’s dying mother, Aznive Karagosian, accepted very young baby Arpenia, nursed and cared for her in her room against all odds because her imminent death was predicted by the medical staff, and ended up bringing her to America and adopting her. Arpenia became Araxi Hubbard. Considerably later, her surname upon her marriage became Dutton, and after her first husband passed away, she remarried and became Palmer. In short, Araxi has been twice married and sadly, twice widowed. She is alive and doing quite O.K. at the ripe age of some 97 years. The materials used in her book about the Hubbard family, her adoptive mother Mary Hubbard and her life, were deposited by Araxi in the Project Save archives in Watertown, Massachusetts years ago but happily we were given full access to the book negatives etc. The photographs and papers donated to Project Save deserve careful study but like so many other worthy projects or endeavors, no efforts that we know of have been made on that front. The photograph of Araxi, which was used on that ‘back-cover Valentine’, shows her to be a beautiful, cheerful child. Such a picture goes far to underscore the value of using an attractive youngster as a Poster Child for fund raising. See http://www.groong.org/orig/ak-20140214.html for a fairly detailed story. A dozen years or so ago, we had the advantage of hearing directly from Araxi her life story and hear how she was part of the Near East Relief fund-raising effort. That made it a great deal easier for us to keep and eye out and eventually find some specific imagery associated with that role she played in fund-raising for Armenian orphans. We even made a concerted effort at that time to video some of Araxi’s story but only posted it on You Tube in 2014. VALENTINE’S PHOTO USED IN 1924 FOR FUND-RAISING. So far, the February 1924 Valentine’s Day cover photo above has no detailed personal story that may be equated anywhere near to the one that has been told of Araxi. 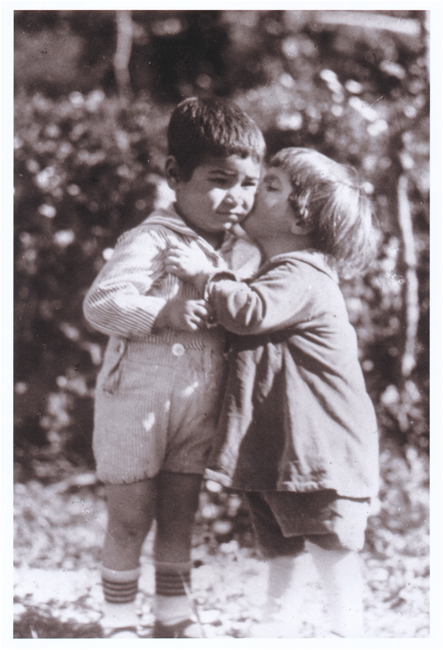 Even so, we are confident that all will agree that it is a wonderful photograph of a little girl kissing a little boy on the cheek. He does not seem, for the moment at least, to be overwhelmed in a positive way from this display of affection. The word is often over-worked but the kids and scene are adorable. If anything may be described as such this is a great example. The scene on the cover is provided below in a better photograph. Unfortunately, we do not know who the children in this photo were. Our friend the late Karekin Dikran of Aarhus, Denmark (originally from Beirut) and who died several years ago made the photograph available to us. He was interested in all things Armenian (see for example his contribution on Maria Jacobsen on “The Danish Peace Academy” http://www.fredsakademiet.dk/library/karekin/ukmaria.htm). Karekin was also a very talented graphic artist and made his living at it. He produced, among other things, some incredibly vividly colored commemorative e-posters of the Turkish genocide against the Armenians. We have never seen such vibrant colors as he generated for those posters! We never met Karekin in person, but we felt we knew him fairly well and carried on an extensive exchange by email. Apparently, we were among the few whom he favored from time to time with copies of the extensive photographic imagery that he had assembled over the years. He was generous in sharing and we are very grateful to him for enabling us to include this photograph, which appears in somewhat cropped fashion on the cover of The New Near East shown above. As our readers will know, we try to use photographs of good or better quality in our posts. Occasionally we are forced to use scans from magazines and journals but that is hopefully a prelude to digging up better material. 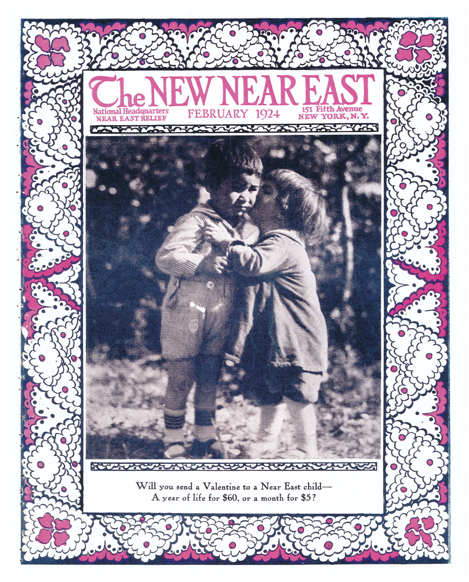 The cover of The New Near East shown above in this “Valentine’s Day Post” comes from a scan from our copy of the February 1924 issue (volume 9, no. II [i.e. no 2]). It is good reproduction but it is nowhere as good of course as the actual photograph supplied by Karekin! We believe, albeit from circumstantial evidence, that the photograph originated in the orphanage for Armenian orphans, the so-called ‘The Bird’s Nest’, at Sidon [Saida, Lebanon] which was intimately associated with the effort of the well-known Miss Maria Jacobsen, originally from Denmark. Perhaps someone ‘out there’ can provide more exact insight into the photograph, or better yet to identify the kids? 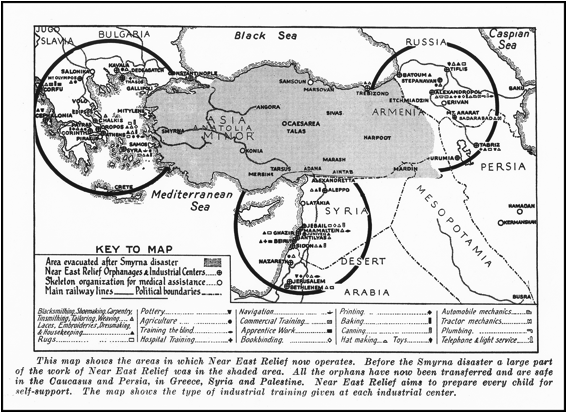 The map below, entitled “Shifting Scenes of Near East Relief Activities” shows how some 20,000 children – Armenian, Greek, Assyrian were evacuated from Turkey. 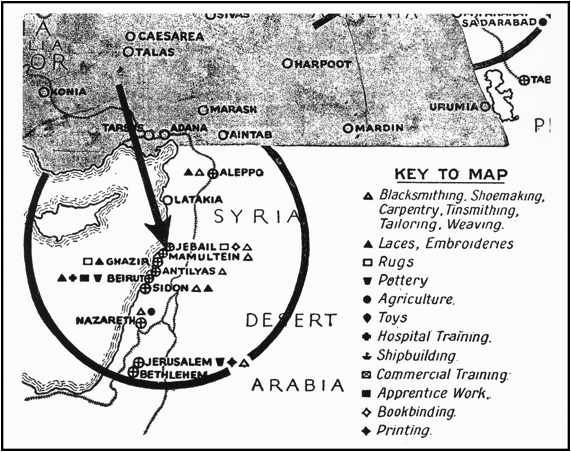 This map was initially published in The New Near East volume 8, no. 11, November 1923 p.13. There is a lot of information provided so we have included a partial close-up as well to allow better examination. Also, political boundaries are shown in greater detail. For example, Mesopotamia may be seen although it is pretty much blocked out by the “Key” in the above maps. The children in ‘our’ photograph are very young of course. The two ‘sweethearts’ may have been kids who had become orphaned after one of their parents, more than likely a mother, had died ‘late’ or was forced, even though alive, to relinquish care of her child or children to the “kindness of strangers.” Who knows? That is but one of the many aspects of the massive tragedy brought on to those who survived the horrors of the Genocide. We don’t know when it was taken, or who took it. Whoever did take it, however, certainly had a good eye. It might have been ‘posed’; perhaps not. While arguable, the dates for the Armenian Genocide are usually given as between 1915 and 1923. The photograph is more than likely from the later period, rather than the earlier. Sad as being an orphan must have been, especially from the perspective of those of us who are adults today, the very youngest children who were victims of the genocide in the broadest sense, are usually described as having lost all memory of what happened, if indeed there was any to begin with. Many did not know their names and were named by their caregivers. All they ended up knowing was what was told them in later years. But the crux of the story is that these children in the orphanages usually found themselves under a kind care that was fully loving and selfless. Those are Valentine’s Day stories unto themselves that should be told in much more detail than has been done so far. Copyright 2016 Armenian News Network/Groong. All Rights Reserved.